Summary: Waking up REALLY COLD, but warms up fast. High 61. Some showers and thunder expected after dark. 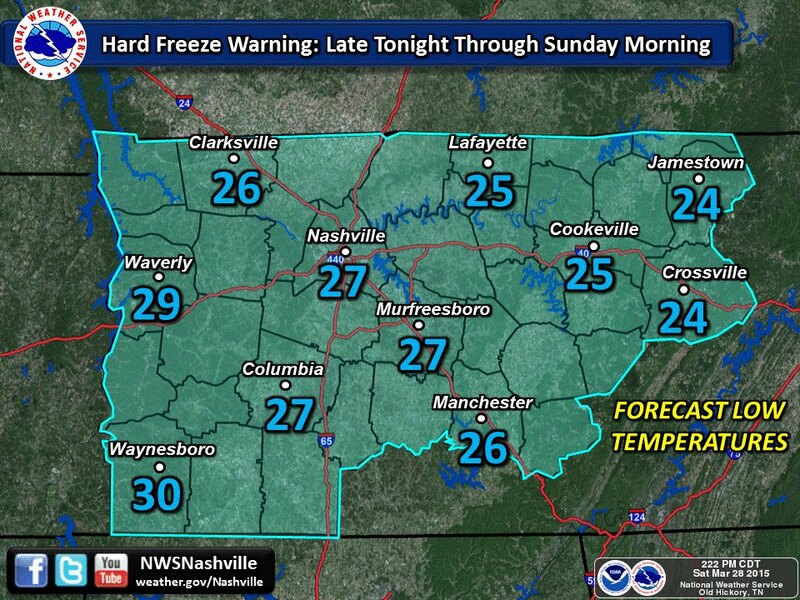 We are waking up during a HARD FREEZE WARNING that is in effect until 10 am this morning. It should warm up rather quickly to about 61 degrees, up 15 degrees from yesterday. Today’s winds should start coming out of the south, helping to bring in warmer, moist air. That moist air will be in place when a cold front moves through after dark, bringing ahead of it some clouds then eventually some rain and even some thunderstorms. These thunderstorms (if any rumbles of thunder) will not be severe. Rain chances go up around 8pm tonight (although exact timing could change), and hang around for about 4-6 hours. Some of this rain could be heavy at times, especially around midnight. Some of the prediction models want to pinpoint the specific timing between midnight Monday morning and 3am Monday morning for this rain. We should get a better grip on timing by afternoon, but they are all very much in agreement on timing as of last check. Update 12:40pm: Models are pretty consistent around the 11pm -1am window tonight for rain and possible thunderstorms. 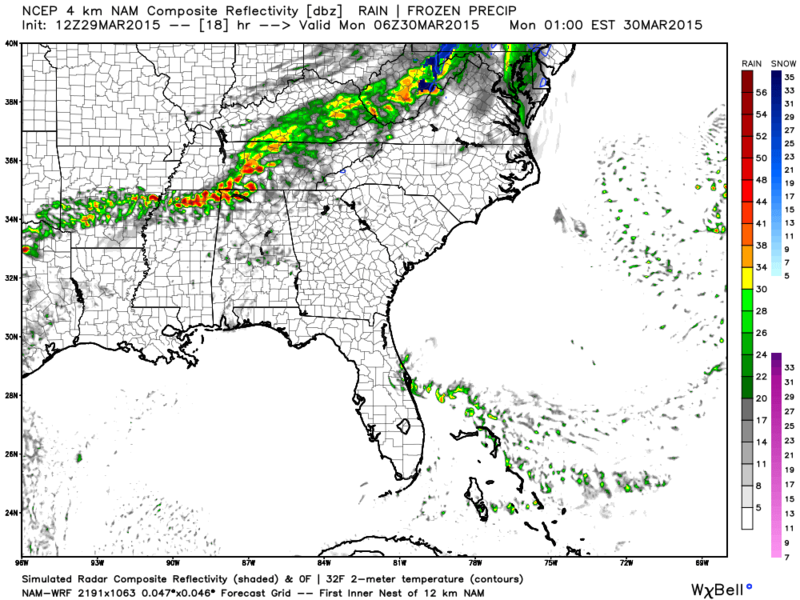 Below is one model showing rain at midnight. LOW STRATOCU DECK HAS BEEN WORKING NORTHEAST FROM MISSISSIPPI DELTA REGION AND BELIEVE WILL CONTINUE TO HEAD THIS WAY AND BECOME BROKEN WITH TIME. SKIES WILL BECOME CLOUDY DURING THE EVENING. UPPER LEVEL DISTURBANCE EXTENDING FROM GREAT LAKES REGION DOWN THROUGH IOWA WITH A COLD FRONT FROM NORTHEAST IOWA INTO A LOW IN NORTHEAST TEXAS. BY 00Z THIS EVENING FRONT WILL BE DOWN THROUGH SAINT LOUIS…NORTHWEST ARKANSAS INTO EASTERN OKLAHOMA. 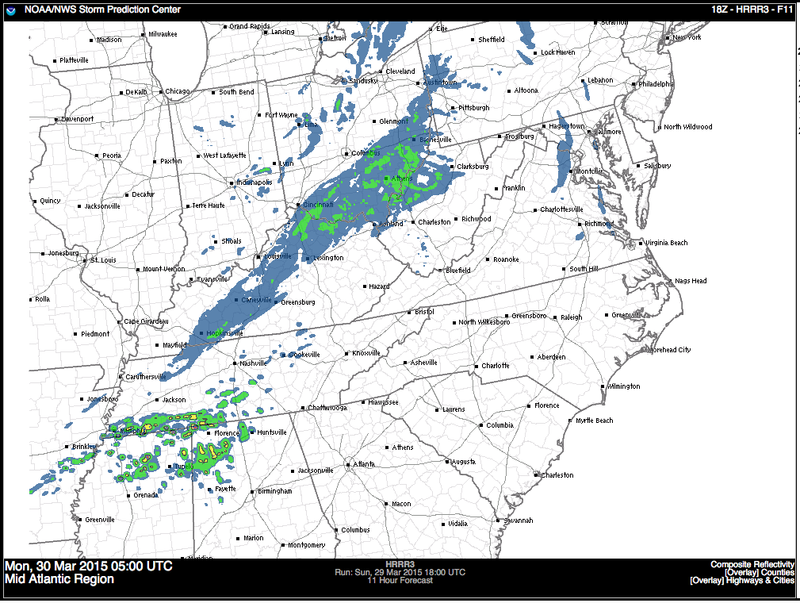 FRONT TRAVERSES THE MID STATE OVERNIGHT WITH SHOWERS LIKELY AND A SLIGHT CHANCE FOR THUNDERSTORMS SOUTHERN THIRD. LOW CONFIDENCE ON THUNDERSTORM CHANCE AS INSTABILITY REMAINS LOW…HOWEVER THERE IS AN ELEVATED MIXED LAYER JUST TO OUR WEST SO THUNDER OVER THE NORTH NOT COMPLETELY OUT OF THE QUESTION…HOWEVER FOR NOW WILL KEEP IT ONLY IN THE SOUTH. MOISTURE TRANSPORT LOOKS GOOD ALONG THE MISSISSIPPI FROM ABOUT MEMPHIS SOUTHWARD BUT QUICKLY GETS SHUNTED EASTWARD ACROSS NORTHERN MISSISSIPPI INTO ALABAMA BY MIDNIGHT AND MID STATE NEVER REALLY GETS A GOOD SHOT OF MOISTURE FOR FRONTAL BOUNDARY TO WORK WITH. COLD FRONT WILL MOVE THROUGH THE MID STATE AFTER MIDNIGHT AND EARLY MONDAY WITH WIND SHIFT TO THE NORTHWEST. PACIFIC AIR MASS BEHIND THE FRONT SO HIGHS IN THE 60S ON MONDAY. Basically it sounds like they believe the rain will break up to be spotty when it gets here because there just isn’t enough moisture going to be in place for a lot of rain to develop. When it gets into more moist air over Alabama and Mississippi, it will allow for more rain to develop south of us. 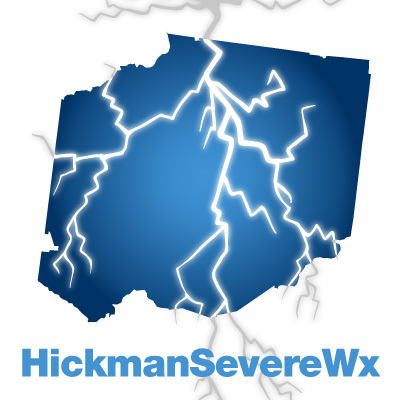 Southern MidTN may actually see more than we do. The HRRR tends to agree with this. Here is the screenshot for 11pm tonight. Upcoming work week: Gradual warm up, then transition into late-week rain/thunderstorms. So far Easter Weekend looks good lovely. We are finally going to feel like we are in spring again, with temps in the high 60’s to low 70’s this week. A rain system will try to push in here around Wednesday, bringing rain and thunderstorms with it for Wednesday, Thursday, and Friday. It’s too far out to say if these will be severe or not. Temps for the work week should be in the lower to mid 70’s (except for Monday). When the cold front moves out by Saturday, temps will dip about 10 degrees for Saturday and Sunday, but should still be pleasant for Easter Egg hunts and other Easter Sunday plans (and it doesn’t appear that rain will interfere with plans this weekend, but this could change).